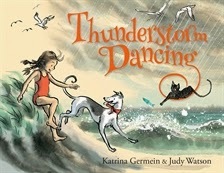 Thunderstorm Dancing is a children’s picture book written by Katrina Germein, illustrated by Judy Watson, and published by Allen and Unwin, 2015. When a sunny day at the beach turns stormy, a little girl runs for cover. Her daddy and brothers are wild in the wind and lightning, and her poppy is as loud as thunder. They fill the house with stamping and crashing while Granny plays piano to their riotous thunderstorm dancing... until the storm passes and they all fall down. Then, in the stillness, the girl is ready to play. What will she be, now that the rain has stopped and there's a glimmer of sunlight? Germein has gifted us with lyrical prose carefully constructed to create tension. Each word contributes to the intense drama of an approaching storm, and yet this is all language kids will understand and relate to. What fun they will have using words like “flicking and flashing - tricking and dashing - crackling zap! - sizzling snap!” in their own poems to create word pictures and sound bites for an audience! I love picture books that celebrate the sheer joy of playing with words. Watson’s illustrations make Thunderstorm Dancing a visual feast as well. Do seek out this wonderful children’s picture book for your home or school. It will make a fine text for reader’s theatre and suits a unit on Families. I can visualise it being brought vibrantly to life as a performance by children using dance, body percussion, voice, language and art work. Find more reviews at The Book Chook by clicking Reviews in the right sidebar. Lovely to have your comment, Judy, and thanks for subscribing to The Book Chook! Looking forward to your next book, too.